Cassini's busy downlinking photos from yesterday's close pass by Enceladus, including some neat shots of Dione and this one where Mimas skipped briefly in to the field of view. 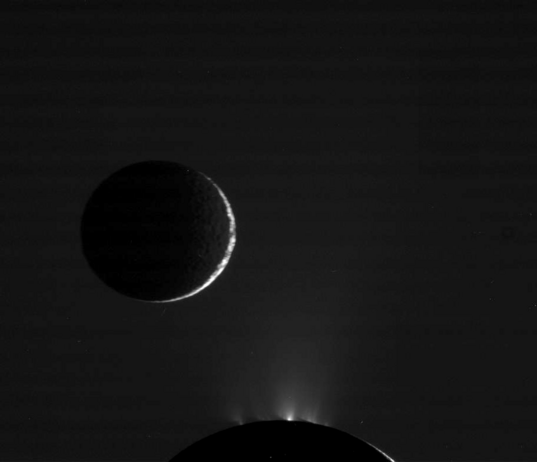 Something about having two moons at once in any Cassini picture just multiplies its coolness by a factor of 10. As Cassini approached for its close flyby of Enceladus on December 20, 2010, it caught Mimas passing through the field of view. The Sun was nearly in front of Cassini so both moons are lit only as very skinny crescents; the lighting highlights Enceladus' plumes, and shines off of tiny particles in the E ring, which provides a lighter backdrop to the dark night sides of both moons. Mimas and Enceladus are actually very similar in size, but Enceladus was much closer to Cassini when the photo was taken. Hope you like it! Here's the original. I tried to take out some of the cosmic ray hits, but hope I didn't introduce any obvious artifacts in the process -- I'm on my traveling computer today and using GIMP, which is just as good as Photoshop (I'm told), but I'm less comfortable with it.